Five years ago, she got a $150 loan from Pro Mujer to start a business. Today, she employs 18 people. 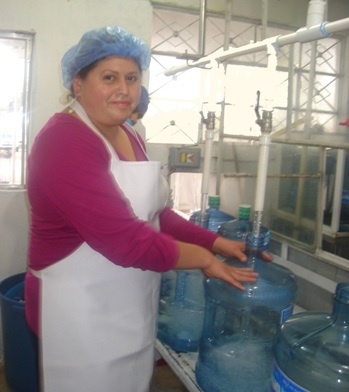 Irma Torres, a Pro Mujer client from Teoloyucan, Mexico, runs a water purification business out of her home. With her husband as her business partner, she meets her family’s needs, while providing potable water to her community. She used to work at a water purification plant. She was underpaid and mistreated by the manager. Her three children suffered too – the older siblings had to go without shoes or milk. Alfonso, Irma’s 9-year old son, suffered from asthma but there was no money for a doctor or medication. In 2004, Irma left her job and joined Pro Mujer. She started her own water purification business and began to turn her family’s life around. Today, all of Irma’s children wear shoes and get the nutrition they need. Alfonso sees an asthma specialist and hasn’t had an asthma attack in over a year. The community benefits too. Irma gives her neighbors discounted water, employs community members, and donates water for every community event. In December 2009, Irma’s hard work and concern for her community’s safety was recognized by the Banamex Foundation which awarded her $2,500 and a free course in accounting, finance, and sales. Irma won first place in the category of Urban Social Responsibility. She invested her prize in a conveyor belt that allows her to increase the production of purified water. The “Banamex’s Microenterprise Award” recognizes the most successful Mexican micro-entrepreneurs. Last year, more than 150 institutions that provide microloans were invited to submit stories of their most successful clients in several different categories. Irma and other four other Pro Mujer clients won awards.